How can we better predict invasions? Ernesto Azzurro, Victor M. Tuset,Antoni Lombarte, Francesc Maynou, Daniel Simberloff, Ana Rodríguez-Pérez and Ricard V. Solé. External morphology explains the success of biological invasions. Ecology Letters (2014) 17: 1455–1463. Active research programs into invasion biology have been ongoing since the 1990s, but their results make clear that while it is sometimes possible to explain invasions post hoc, it is very difficult to predict them. Darwin’s naturalization hypothesis gets so much press in part because it is the first to state the common acknowledgement that the struggle for existence should be strongest amongst closely related species, implying that ‘invasive species must somehow be different than native species to be so successful’. Defining more generally what this means for invasive species in terms of niche space, trait space, or evolutionary history has had at best mixed results. A couple of recent papers come to the similar-but rather different-conclusion that predicting invasion success is really about recognizing context. For example, Azurro et al. point out that despite the usual assumption that species’ traits reflect their niches, trait approaches to invasion that focus on the identifying traits associated with invasiveness have not be successful. Certainly invasive species may be more likely to show certain traits, but these are often very weak from a predictive standpoint, since many non-invasive species also have these traits. Morphological approaches may still be useful, but the authors argue that the key is to consider the morphological (trait) space of the invaders in the context of the morphological space used by the resident communities. Figure 1. From Azurro et al. 2014. A resident community uses morphospace as delimited by the polygon in (b). 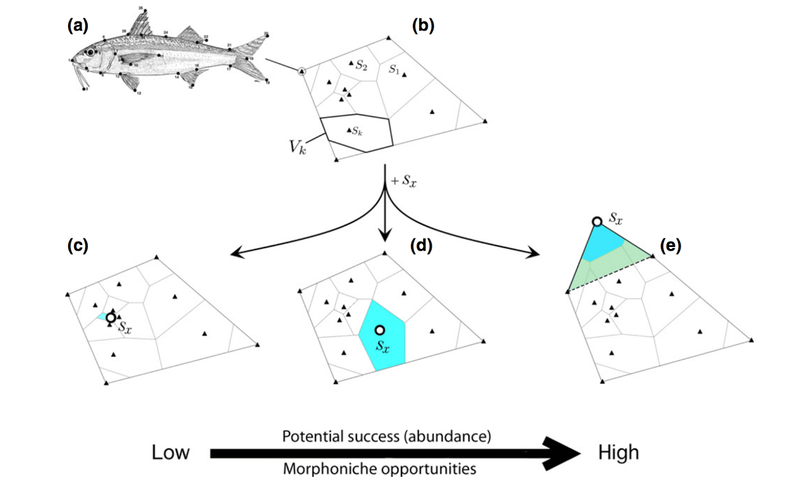 Invasive species may fill morphospace within the same area occupied by the community (c) or (d)) or may use novel morphospace (e). Invasiveness should be greatest in situation (e). Figure 2. From Azurro et al. 2014. Invasion success of fish to the Mediterranean Sea in relation to morphospace, over multiple historical periods. Invasive (red) species tended to exist in novel morphospace compared to the resident community. A slightly different approach to invasion context comes from Jason Fridley and Dov Sax, who revision invasion in terms of evolution - the Evolutionary Imbalance Hypothesis (EIH). In the EIH, the context for invasion success is the characteristics of the invaders' home range. If, as Darwin postulated, invasion success is simply the natural expectation of natural selection, then considering the context for natural selection may be informative. In particular, the postulates of the EIH are that 1) Evolution is contingent and imperfect, thus species are subject to the constraints of their histories; 2) The degree to which species are ecologically optimized increases as the number of ‘evolutionary experiments’ increases, and with the intensity of competition (“Richer biotas of more potential competitors and those that have experienced a similar set of environmental conditions for a longer period should be more likely to have produced better environmental solutions (adaptations) to any given environmental challenge”); and 3) Similar sets of ecological conditions exist around the world. When these groups are mixed, some species will have higher fitness and possibly be invasive. Figure 3. From Fridley and Sax, 2014. How to apply this rather conversational set of tenets to actual invasion research? 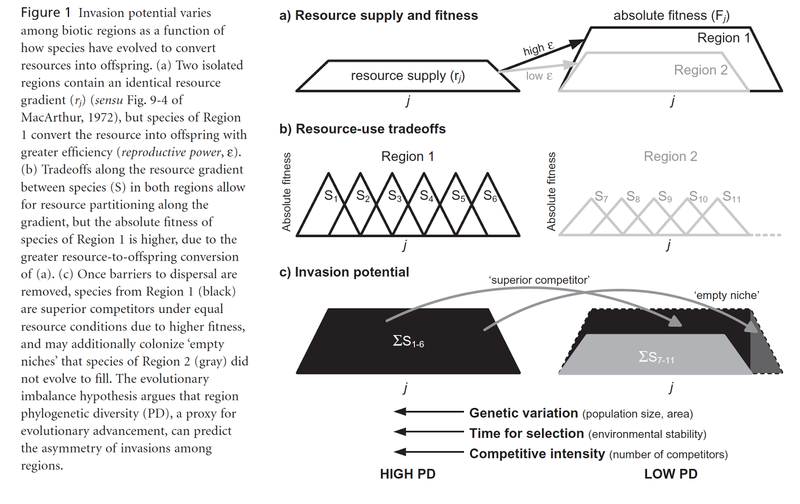 A few factors can be considered when quantifying the likelihood of invasion success: “the amount of genetic variation within populations; the amount of time a population or genetic lineage has experienced a given set of environmental conditions; and the intensity of the competitive environment experienced by the population.” In particular, the authors suggest using phylogenetic diversity (PD) as a measure of the evolutionary imbalance between regions. They show for several regions that the maximum PD in a home region is a significant predictor of the likelihood of species from that region becoming invasive. The obvious issue with max PD being used as a predictor is that it is a somewhat imprecise proxy for “evolutionary imbalance” and one that correlates with many other things (including often species richness). Still, the application of evolutionary biology to a problem often considered to be primarily ecological may make for important advances. Figure 4. From Fridley and Sax 2014. 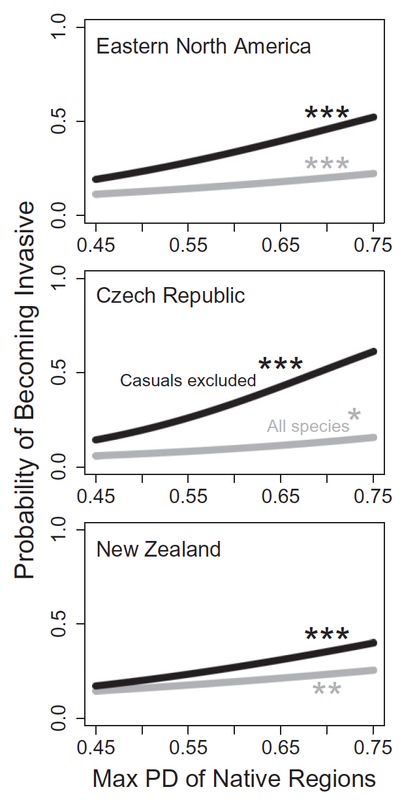 Likelihood of becoming invasive vs. max PD in the species' native region. What is ecology’s billion dollar brain?